Randalstown Pharmacies Ltd. has a long history of helping the people of Randalstown and the surrounding area with their health. 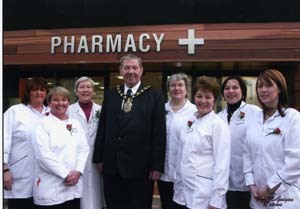 In 2005, J.J Daly’s Chemist and Maine Pharmacy which both served the area for many years merged to form Randalstown Pharmacies Ltd. keeping premises on Randalstown’s Main Street and opening new premises in Randalstown’s new Medical Centre. We have seven fully qualified Pharmacists working in our two Pharmacies as well as Counter staff who are all very knowledgeable about our wide range of products. At Randalstown Pharmacy we have regular friendly, helpful staff and you can be assured of an excellent level of service. We have a section allocated to health information to keep you informed of all the current health campaigns. Our consultation room is available for any private health matter that you wish to discuss and naturally it is also used for our wide range of health services. If you come into the pharmacy with a regular or an acute prescription, and you wish to have any further information on your illness or your medication, we will be only too happy to speak with you and if required print you any relevant information you may need. Alternatively, for people with Internet connections, you may simply log on to this website for all the help you could need in one place and easy to understand explanations of common illnesses. We offer a Repeat Dispensing Service which allows patients on regular medication to pick up their prescription straight from the Pharmacy with out any hassle. We also have a delivery service for patients in the Randalstown area who have difficulty leaving the house to collect their prescriptions. Our Main Street shop also carries a wide range of toiletries and cosmetics including Rimmel and Bourjour. We are also one of the few suppliers of Vichy and Nuxe products in Northern Ireland.